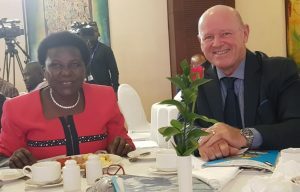 Kampala (Uganda) – December 7, 2018 (travelindex.com) – Seychelles former Minister for Tourism, Civil Aviation, Ports and Marine, Alain St. Ange, was invited to deliver the keynote address at yesterday”s Uganda Civil Aviation Authority’s Aviation Stakeholders Breakfast meeting at the Kampala Serena Conference Centre. Alain St. Ange captured the full house audience’s attention with his off the cuff free flowing address and was applauded when he spoke about the theme for this year’s Aviation week that said : Working together to ensure no country is left behind. ‘Uganda and Ugandans must ensure that Uganda is not left behind’ St.Ange said before he highlighted the need to have aviation and the entire tourism industry work hand in hand. He said that ‘… both industries are closely linked and their mutual success is dependent on each other. Both sectors need to work together to reach national target projections for passengers and visitors‘. He also underscored that both aviation and tourism need to become sustainable for long term success. On a different note the Seychelles former Minister made everyone in the packed conference hall take notice when he told them that being one of the world’s best kept secrets no longer cuts it and that Uganda, a country he had visited in similar capacities before, had what it took to shout their attractions from the roof tops and drive the message home on a daily basis. ‘Visibility is a key element to promote a destination, you need to be seen to showcase your attractions every day‘. St. Ange is of course remembered in the Seychelles as the initiator and driver of a relentless marketing drive and his constant engagement with the global tourism trade and in particular the travel media, which saw the archipelago punch well above its weight as a tourism destination and led to a decade of growth when other competing destinations faltered. St. Ange’s presentation and added interaction with local media and attendees of the meeting for over an hour after the proceedings had officially concluded once again shows that Africa has some superb talent to call upon when, be it on the continent or beyond, such meetings take place and require specific insights and experience from and about Africa. St. Ange’s deep knowledge from his time in both private sector and in government, besides his speaking eloquence, no doubt will see him called upon as an expert of tourism and Brand Africa. Uganda’s Works and Transport Minister Hon. Monica Ntege, in turn acknowledged and quoted in her own speech on several occasions St. Ange’s key points and invited him to return to Kampala for the 2019 edition of the Pearl of Africa Tourism Expo. Meanwhile did UCAA’s Managing Director Dr. David Mpango Kakuba highlight a number of achievements the authority can look back at during the soon to end year 2018.
International airlines now serve Entebbe with scheduled flights, as do 26 non scheduled airlines. Next on Entebbe’s horizon will be Israel’s El Al, due to launch flights in February 2019, following the conclusion of a new Bilateral Air Services Agreement between Uganda and Israel. He also provided passenger numbers for Entebbe, which in 2017 reached 1.620.000 compared to a measly 118.000 in 1991. During the first 8 months of 2018 did this figure again rise by 120.000 passengers, suggesting that by year’s end passenger throughput will exceed 1.8 million. Uganda’s CAA also attained the coveted ISO 9001:2015 Quality Standard as only the third regional aviation body after Kenya and Tanzania.